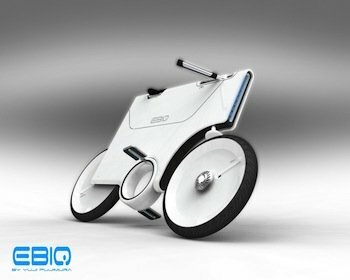 NYC-based Industrial designer Yuji Fujimura has developed a unique electric concept bike. It has the shape of a ‘fat’ credit card with two wheels at the bottom corners. Instead of the popular and familiar diamond frame design, Fujimura has opted for a flat solid box on wheels where the handlebars, seat and pedals fold away flat to help squeeze the bike into tiny parking spaces. 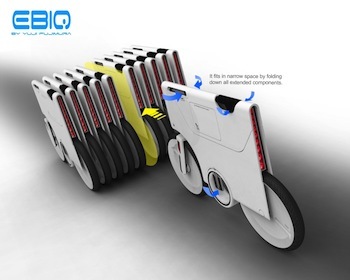 You might be able to park 5 of this super thin bike onto the space that you need to park one conventional bicycle. 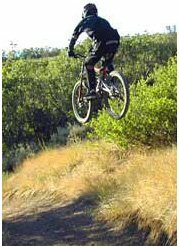 The bike can be used as an electric bike or as an electric motor cycle. When in motor cycle mode, both pedals will set themselves at the lowest position. 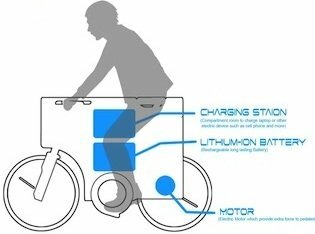 Beside the conventional rule of the battery, Fujimura has designed it to serve also as a power source to any gadget stored in the compartment located underneath the seat. You can recharge your laptop, cellphone, ipod or any other electronic gadget you decide to embark with.